Quinoa nutrition, first of all, quinoa calories: Quinoa has about 222 calories per cup. 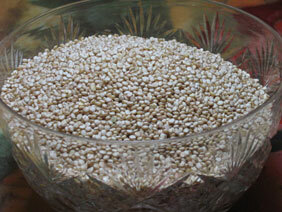 Quinoa carbohydrates: It contains 39 grams of carbohydrates per cup. But what sets this grain apart is the fact that quinoa is the grain with the highest amount of protein of any grain. Quinoa contains all essential amino acids which makes it a complete protein. Most other grains are missing amino acids. However, quinoa should not be the sole source of protein for your meal, it should be your grain. 8 grams in one cup is not a lot when men need 55 grams pf protein per day and women need 45. Quinoa is also high in antioxidants and as more research is being done, we will continue to discover numerous benefits of this super food. I eat quinoa almost every day. It is one of the most versatile grains there are. I love it because, it is so easy and fast to cook. Unlike brown rice it is much better cold in any kind of salad, or simply as a side dish as a grain with a little Braggs healthy natural soy sauce sprayed on top. Because it is much lighter than brown rice, I find I need more of it to fill me up. Quinoa (pronounced Keen-wah) is a plant from the beet and spinach family, that produces tiny seeds. Quinoa is actually a seed but it cooks up like a grain. Quinoa seeds are naturally coated with an insect-repelling coating called saponin. Since quinoa has so quickly gained in popularity it is pre-washed or put through an abrasion process, but I find it always best to rinse grains first before cooking. Quinoa is now sold in most grocery stores in the "healthy organic section. You can buy it in bulk at health food stores, which is probably the cheapest way, or online. Cooking quinoa is simple and only takes 15 minutes! As soon as it boils, cover and simmer for about 15 minutes or until all the water has been absorbed. It is easy to see why making quinoa a staple in your diet is one giant step along your path to obtaining optimal health and high energy every day.